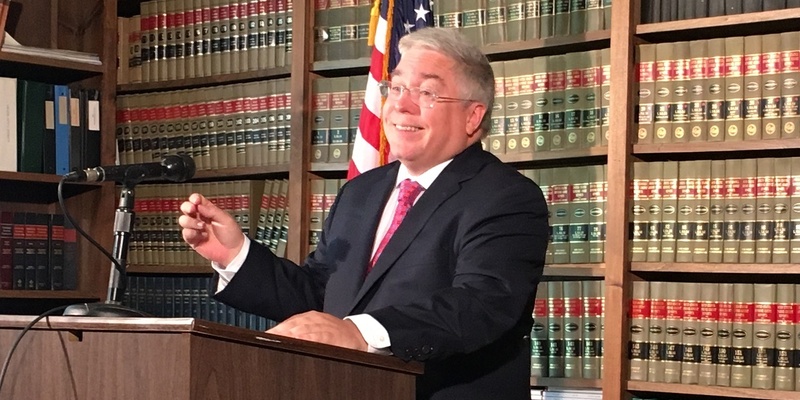 CHARLESTON – West Virginia Attorney General and U.S. Senate candidate Patrick Morrisey has been named as a defendant in a lawsuit regarding a 2017 auto accident. Erica Faith Johnson, who lives in Kanawha County, filed a complaint Oct. 26 against Morrisey in Kanawha Circuit Court. According to the complaint, Johnson was traveling southbound just across the 35th Street Bridge into Kanawha City in the left lane. Morrisey was driving in the same direction in the middle lane. The resulting accident caused severe and permanent injuries to Johnson, according to the complaint. Morrisey “operated his vehicle in a negligent, careless and reckless manner which caused the motor vehicle collision,” according to the complaint, which also noted that Morrisey made an “improper turn,” according to the investigating officer. Johnson says she has sustained economic and non-economic damages that include past and future injuries, medical expenses, pain and suffering, annoyance, aggravation and mental anguish. She seeks compensatory damages as well as pre- and post-judgment interest, attorney fees, expenses and court costs. Johnson is being represented by J. Kristofer Cormany of Cormany Law in Charleston and Kevin P. Davis of Charleston. The case has been assigned to Kanawha Circuit Judge Tod Kaufman. Morrisey was elected as AG in 2012 and again in 2016. He lost in his bid to oust Democratic incumbent U.S. Sen. Joe Manchin in the Nov. 6 general election, but he remains the state's AG. Both Morrisey’s office and his campaign declined to comment on the matter.